Gill Crennell has kindly offered to host a club get-together & BBQ on Sunday 14th September from 3:00 pm onwards at her home:The Turrets, Ballaquane Road, Peel. All ages welcome. The club will be providing the food and soft drinks, with club members welcome to bring their own alcoholic beverages. The event will also incorporate the Club’s AGM which will be kept to the minimum requirements of election of club officials and a short statement of accounts. There will also be the opportunity to place orders for new club kit. So that we may plan for food etc., please let Gill know if you are planning to attend. I look forward to seeing you there on the day. This weekend sees the promotion of the Rob Rohrer Memorial TT, which this year incorporates the IOM 25-mile TT Champs. Entries on-line via the link on this site. NO LATE ENTRIES OR ENTRIES ON THE DAY. Anyone who is able to help or wishes to ‘stand-down’ from the BGC series and gain Marshalling points, should contact Ian Brand on 842891. Following the tragic loss of Kate Burge in a traffic accident this week, her friends in the cycling world will be thinking of her this weekend in particular as we head out on our bikes. Kate was a regular on the the weekly ‘Scone Run’ groups that head out around the North of the Island every Saturday morning and then meet up together at the Sulby Hotel for refreshments after their rides. If anyone is out and about this Saturday, then Rosie at the Sulby is opening up the marquee at the back of the Hotel from 1130, so all that are passing may drop in and remember Kate. 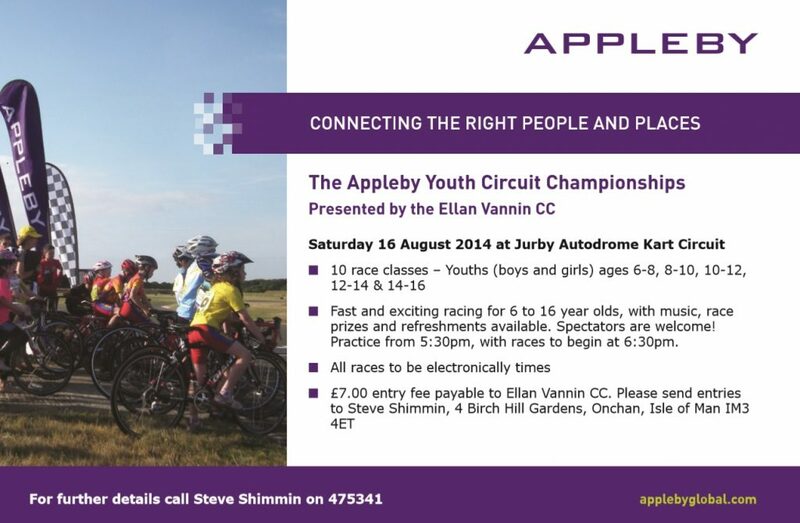 Ellan Vannin CC are pleased to bring you the second edition of The Appleby Circuit Champs! Let me have your entries as soon as possible please. Make cheques payable to Ellan Vannin CC. All the usual races plus a handicap finale. Entries close on Tuesday 12th August.